Chief Instructor, Richard Wagener has been training since 1972 . Wagener Sensei holds a sixth degree black belt and has been appointed Shihan - (holding a Master Instructor's Certificate from World Headquarters in Japan). Wagener Sensei focuses on strong, clean, centered technique, and stresses the relationship between weapons and empty-hand technique. Aikido is known by its taijutsu or empty-hand techniques. However, the taijutsu movements are based upon the movements of the ken. It is a harmonious blending of the two that creates a single Aikido. 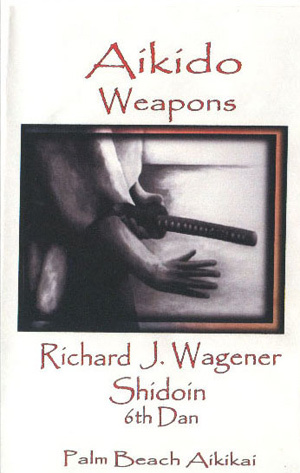 This DVD is intended to help explain the basic weapons requirements for students of the Palm Beach Aikikai. It was produced with the intention of being used in your actual practice. Therefore each exercise is repeated several times for you to watch and mimic, as you would do in the dojo. Each sensei has his or her own interpretation of these movements. With committed practice you will become more proficient at these exercises. You will be able to travel anywhere in the world, train Aikido Weapons, and feel confident and knowledgeable, and therefore able to gain your own personal insights into Aikido Weapons work. The Founder taught that Aikido is an extremely versatile and efficient martial art. It does not rely on weapons, but upon body movement. A weapon should simply be an extension of the body. To build this feeling, one should practice consistently the basic exercises of ken and jo suburi, tai no henko, and kokyudosa. A good understanding of these basic exercises will enable the practitioner to move smoothly and confidently with or without weapons.